What's up everyone! Today's post is going to be a little different - not only did I recently reach the mile marker of FOUR HUNDRED recipes written and posted on my site (this post technically being the 426th post), but today I was nominated for a Sunshine Blogger Award by one of my fellow blogger buddies! The Sunshine Blogger award is given by bloggers to bloggers who inspire positivity and creativity in the blogging community. I am honored to accept this award from Victoria at One Sharp Mama and pass on the love to other bloggers I take inspiration from. To celebrate the acceptance of this award, here are some of my favorite recipes from the last hundred or so I've written this year. Be sure to check out the bloggers I've nominated for the Sunshine Blogger Award at the end of this post. Even I get 'over cooked' from time to time. That's why I love making really simple, easy lunches and dinners from food I find in my cabinets and fridge door - with as few dirty dishes as possible. 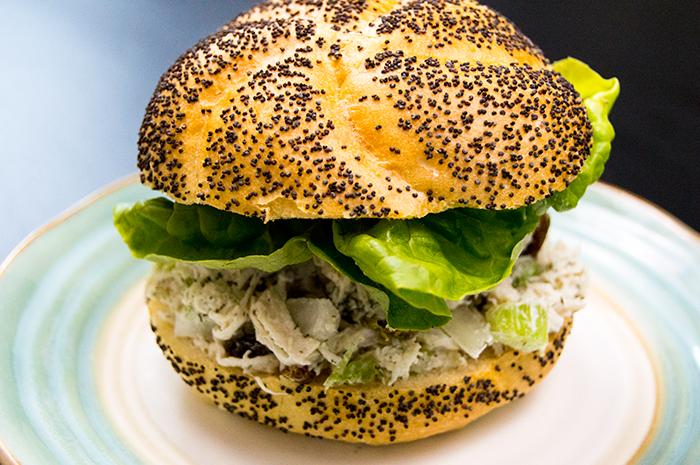 That's how this chicken salad came to be - I dug out some old frozen chicken and within 20 minutes transformed it into something delicious to eat throughout the week. It may sound like an unusual combination, but I promise, it was strangely delicious and left me craving more! 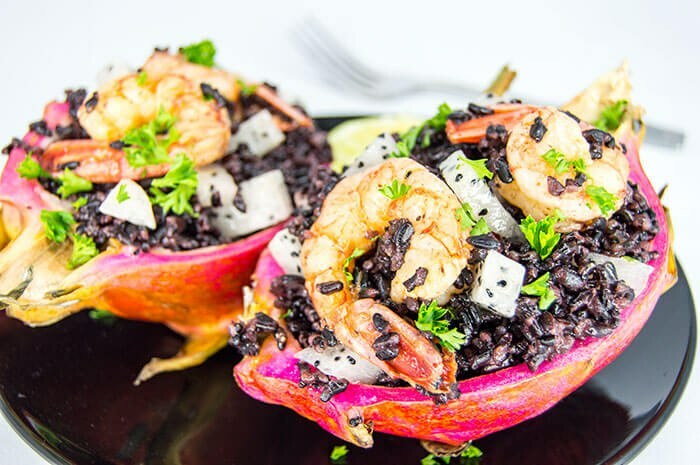 I ate all the leftover dragon fruit for breakfast the next day, and actually enjoyed the leftover rice and shrimp cold! It made for a great refreshing lunch. Fortunately for us peasants, no fire is required to harness the power of these dragon eggs - they're made mostly from peanut butter, cocoa and oats. I'd like to think my dragon eggs would have reunited the seven kingdoms under the power of deliciousness. The cannoli shells cut at an angle are the perfect vessels for transporting the sweet ricotta cheese filling to your mouth - as much or as little as you want. The shells are pretty tasty on their own as well. 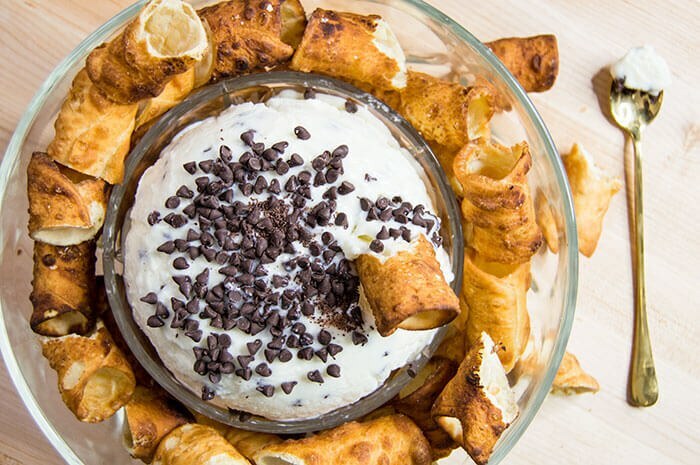 The dip can be used for anything from cannoli shells to fruit, graham crackers, waffle cones, cookies and more! The best part about traditional chicken parmesan is that, if done correctly, you can make the entire thing in one pan. My chicken parm meatballs only required an extra bowl for mixing the ground chicken up with herbs and spices, but only one pan was required to cook everything up! Victoria from One Sharp Mama had some questions about me - The Starving Chef! Who is your blog and what do you write about? My blog started as a way to save money in college and continued into my post-grad life as a fun excuse to learn skills in not only cooking, but photography and videography, two big passions of mine. To cook, to teach others to cook, and provide delicious food to those who don't know how to cook! If you could be anything, have any profession, what would that be? Surprisingly, I wouldn't want to be a chef! I love cooking at home and I love my day job in web development - but little known fact: when I started college, my major was in environmental and freshwater marine biology! I'd love to hunt for bugs and critters in creek beds to determine stream health and biodiversity in freshwater environments. Harry Potter and the Prisoner of Azkaban will always have a soft spot in my heart - but basically EVERY Harry Potter book is my favorite. Cuddle with my boyfriend and puppies, maybe watch some guilty pleasure reality TV like Big Brother, and have some take out from our favorite Chinese restaurant. I'm invested in so many shows at the moment - one day I might say Game of Thrones, the next day I might say Avatar: The Last Airbender or the Legend of Korra. I've rewatched all of them too many times to count. Pay off all my student debt and buy a house with my dream kitchen! I've learned to love Facebook but I spend way more time watching videos on Youtube! I'm just getting the hang of Pinterest too - I recently passed a milestone of 101k monthly viewers! If you could meet any celebrity, would would it be and why? I'd love to meet Gordon Ramsay or Alton Brown - basically any celebrity chef is welcome to cook in my kitchen any time! Depends on what's in the glass! I'd say the glass is half empty BUT if I've enjoyed what is in the glass, it's worth it! Jordan at Read. Eat. Repeat. Thank the blogger who nominated them and link back to their blog in a post form. What inspired YOU to start your blogging journey? What's your "claim to fame"? What's the most frequent question people ask you about your blog? Why did you decide to do the work you do now? How does your blog influence your daily routine? Thanks again to Victoria - and HAPPY BLOGGING ALL!